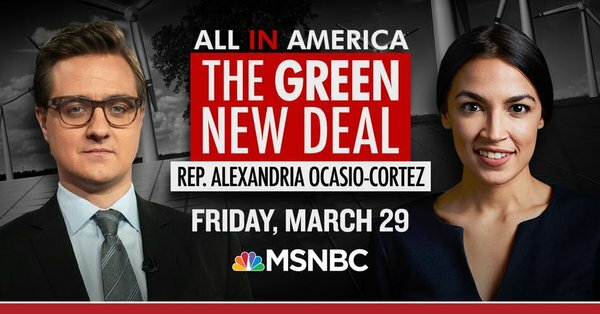 'Rock Star' Alexandria Ocasio-Cortez Headlines MSNBC Green New Deal Town Hall at the--wait for it--Albert Einstein School of Medicine; Says, "No Future for Future Generations"
She’s no Einstein, she has a 23 percent approval rating, her Green New Deal was just voted down in the Senate with just a handful of support from Democrats–most of who opted to vote “present”–but on Friday night MSNBC is airing a Green New Deal town hall held in her district at the Albert Einstein School of Medicine headlined by Rep. Alexandria Ocasio-Cortez (D-NY). A local reporter said she was given a ‘rock star’ reception by the crowd of several hundred in attendance. The town hall was taped Friday afternoon. The Einstein School explained in a promo for the event why they were chosen to be the host. NBC/MSNBC’ Beth Fouhy posted a gushing promotional blurb for the town hall. NY1 reporter Bobby Cuza posted a few brief reports on the town hall, including the ‘rock star’ reception and Ocasio-Cortez musing she could turned out of office by voters after only one term. Cuza also noted an anti-Trump Republican was part of the show. So AOC is taping town hall right now at Einstein College of Medicine with MSNBC's Chris Hayes (airing tonight) and the rock star reception she gets in the room is truly startling. Never seen anything remotely like it with another politician. AOC does not offer much when asked about her political future. Says it's possible "I'm in office for two years and I take huge political risks and they kick me out." Interesting to see some in crowd hiss and heckle former GOP Rep. Bob Inglis's after he references to "Tea Party of the left." AOC: "The Koch brothers funded the Tea Party and everyday people funded my campaign." Inglis is anti-Trump and has long worked to fight climate change. For some reason, MSNBC’s promotional department thought this video of the line for the town hall was worth promoting. AOC supporter and Justice Dems activist Waleed Shahid was there. Video clip posted by MSNBC. "This does not mean we change our entire structure of government, but what it means is we need to do something."